Graduating from Oregon State University I earned two Bachelor of arts degrees; International Business, and International Studies, and a minor in Spanish. I studied in Barcelona where I focused on art and architecture. I enjoy the works of Dali, El Greco, Velazquez, Picasso and Remidos Varo. I studied native Zapotec and Mayan culture, Spanish, mole and mezcal in Oaxaca. Because of these experiences I developed a passion for wine, spirits, food, art, language and culture. A chance of a lifetime presented itself in 2006, when Michel Simonnet and Jacky Allary tasted with me in Oregon and offered me the opportunity to sell their Frech Oak barrels in the US market. Today the twelve years of experience in cooperage as the North American Sales Manager for Allary has allowed me the ability to taste in hundreds of cellars, acquire expert knowledge of French oak barrels, oak fermentation, French forests, seasoning and toasting techniques. I have a passion for beauty and balance in oak harnessing the elemental synergy of oak, fire, water and wine. We have grown our business steadily through diligent work, learning about our customer's wines, trialling barrels, tasting, adjusting toast levels to obtain the highest level results. This valuable experience allows me to accurately offer my clients the best recommendations for their wines without losing time. Our aim is that our customers expectations are exceeded with ALLARY barrels and service. 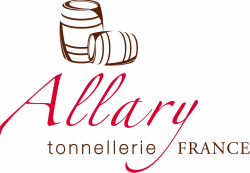 I remain grateful for the opportunity to earn your confidence and support for one of the best and most respected cooperages in France, Tonnellerie Allary. Born in 1962, he is a second generation master cooper and president of Tonnellerie Allary. His dad Roger remembers when he was just learning to walk that he was already curious about his father's work and fascinated with the art of making barrels. To watch Jacky work is incredible, he is a true oak alchemist with a passion for his craft. Jacky himself was twice awarded MEILLEUR OUVRIER DE FRANCE and the talent for the art of cooperage runs strong through Jacky's veins. He is well respected by his peers and customers alike and knows how to do everybody's job in the cooperage. Jacky has the connections and access to the best forests and most prestigious oak in all of France. A very important aspect for the future of our cooperage is that Jacky possess the desire to grow and maintain an honest family business. He does not to wish sell to a big corporation and he always will maintain a large stock of well seasoned oak. This allows our customers to have confidence in Tonnellerie ALLARY and they can rely on consistency in quality from year to year. The year was 1950 and in the small village of Juillac Le Coq (near Cognac) Mr. Roger Allary married his lovely wife and rented a very old home. The winters were quite cold, the home was not well finished and the young couple could see the sky through the ceiling. Mr. Allary and his wife well remember the long, hard nights together and dreaming of a better home. Roger always had a talent for woodworking and was lucky enough to be mentored by a master cooper in the region. At this time the training was called "hand-made trainee cooper". Roger had to craft a 400L barrel alone and only by hand. A very difficult task indeed. Normally the training lasts 3 years but Roger was a talent, he learned quickly. After learning the art he enrolled in “service militaire” (mandatory for 3 months in the early 1950's and Roger stayed an additional 2 years until the year 1952). 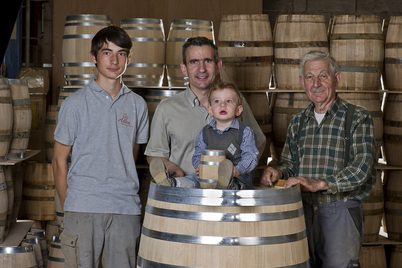 After his military service was completed Roger came back to Juillac Le Coq where he started his own cooperage as a craft job. Roger made barrels and large-sized tanks of 30HL, 60HL and even sometimes 120HL with only the help of his wife. The Allary Tradition would not be possible without the years of help and support of Mr. Roger Allary's wife. Through years of hard work, skill and determination Mr. Roger Allary pruchased his own land in 1971 in Archiac, France where Tonnellerie Allary is now located. To this day Mr. Roger Allary still works in our cooperage and overseas the artisan workshop.